A couple of months ago I went by the home of my maternal great grandparents John Taylor Roberts and Catherine (Kate) Margaret Young mainly to just visit the house but to also see the rebuilding progress. A fire on January 30, 2011, gutted the interior and burned off the roof and attic. 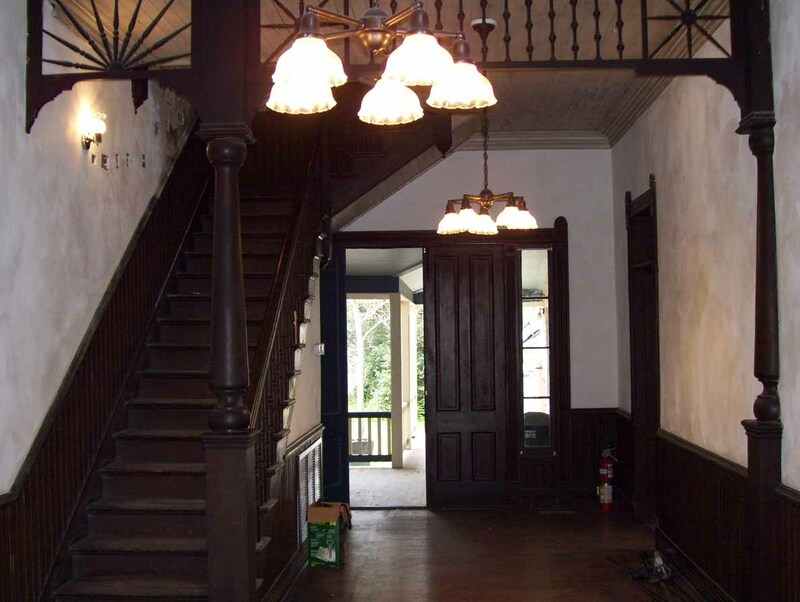 The first photograph was taken of the entrance hall in 2008 before it was renovated by the Valdosta Heritage Foundation who is current owner and who is restoring/rebuilding the house as funds allow. The second photograph was taken in 2013 after rebuilding had begun "post fire." 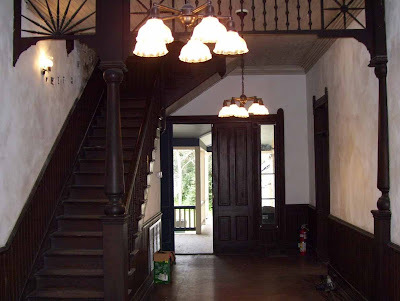 The entrance hall in my maternal great grandparents', John Taylor Roberts and Catherine (Kate) Margaret Young, house in 2008, three years before the January 30, 2011, fire that gutted the interior. Rebuilding progress of the entrance hall as of July 27, 2013. Don't worry. I didn't go inside. I took this through the plate glass window on the front door. For further reading about this great house that we call the Big House (aka the Roberts House and the Wisenbaker-Wells-Roberts House) see The Big House and After the Fire. The photo behind my blog title was taken of the Roberts descendants on the side porch on the south elevation of this house.